It’s a raintastic Sunday afternoon in “ASAP” as “Loving In Tandem” lead stars Kisses Delavin, Marco Gallo, Edward Barber, and Maymay Entrata and pop rock royalty Yeng Constantino join the party together with “The Voice Teens” idols Isabela Vinzon, Jeremy Glinoga, and Jona Soquite. Be amazed with the big shot talents from “Little Big Shots” kids, Charley, the bellydancer, JM, the hiphop dancer, and Zianne, the young cheerleader, as they show off in the “ASAP” stage with Maja Salvador, Janella Salvador plus Liza Soberano and Enrique Gil. Viewers are also in for a must see treat from BilboardPH’s chart toppers Inigo Pascual, Jona, and KZ Tandingan. “ASAPinoy,” meanwhile, pays tribute to the songs of Dingdong Avanzado to be led by tribute master Gary Valenciano with Gino Padilla, Luke Mejares plus Dingong’s wife Jessa and daughter, Jayda Zaragoza and more. Finally, don’t miss the chance to hear Birit Queen Klarisse de Guzman’s newest single. Don’t miss “ASAP” this Sunday (Sept. 10), 11:45 AM, on ABS-CBN or ABS-CBN HD (SkyCable ch 167). Catch up via iwantv.com.ph or skyondemand.com.ph for Sky subscribers. 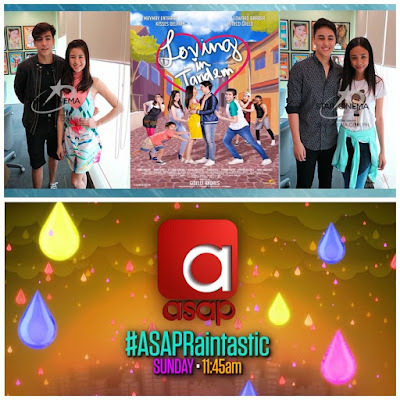 Don’t forget to share your thoughts this Sunday using the official hashtag #ASAPRaintastic.